Royal, revolutionary, glamorous, “Britannia” won over 200 first prizes, still an unbeaten record, the first superyacht. Shown here with her original gaff rig, as the Royal Yacht Britannia first appeared when new. Most pictures of Britannia show her in her glory days, few are available showing the original J Class gaff rig. To discover why this picture is a real collector’s item, read on. I was generously given access to the Beken of Cowes archives. Most of the 19 th century photography was on glass plates which I was allowed, privileged, to handle. The Bekens knew I had trained in part on B/W glass plates during my first year at Maidstone Art College. The result was an enduring friendship and my painting of the Royal Yacht Britannia 1893 researched by kind permission of Keith and Ken Beken from among their father / grandfather’s original glass plates at Beken of Cowes. Ken Beken, whose Father took the photos, was able to advise me on colours, in particular mentioning most artists paint the sails a ‘modern’ white which to his eye, having seen those yachts, is a glaring white error. The picture went into print via Solomon & Whitehead Ltd; on the last count, (2017) I have the last 2 unsold copies here waiting for a good home. Royal Yacht Britannia certainly had a huge impact on the public, promoting Yachting (which we now call sailing!) by annually visiting and racing at most major British ports adding glamour and Royal kudos. Britannia was built by D & W Henderson of Clydeside especially for the Royal family whose links with yachting go back at least as far as the days of the “merry monarch”, King Charles II. She measured 102 feet & set 10,000-sq. ft. of sail. 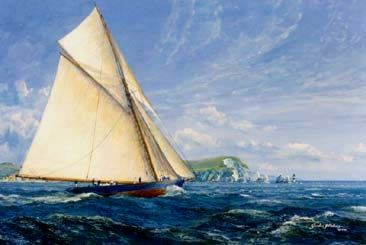 Launched to race against straight stemmed & clipper bowed Victorian cutters, her long convex overhangs were considered new, radical & ugly. Britannia was crewed thought out her life mostly by fishermen from the village of Wivenhoe, Essex (see Wivenhoe’s history of the Royal Yacht Britannia), and other River Colne villages. This painting was appropriately eventually sold to one of their descendants living in Wivenhoe. Enjoying your visit? Found something you like? Share with friends, spread the word to all who appreciate the sea, fine art and history. You can help other people discover, enjoy, benefit from this remarkable, unique project widely know. Great souvenirs, a fine spirited painting.